So, what are you going to do with all that glorious Stock/Broth you’ve made with your leftover turkey this year? I’m voting for Turkey Noodle Soup – a family favorite. Once you have broth, it couldn’t be much easier, but a good canned broth will work, too. Feel free to make this with Chicken, as well. I think the home-made broth really makes the soup, but another optional home-made addition is home-made egg noodles. They have just a bit more heartiness to them and are like a premium frozen noodle. Well, except that there are no additives and they taste so fresh and wonderful! 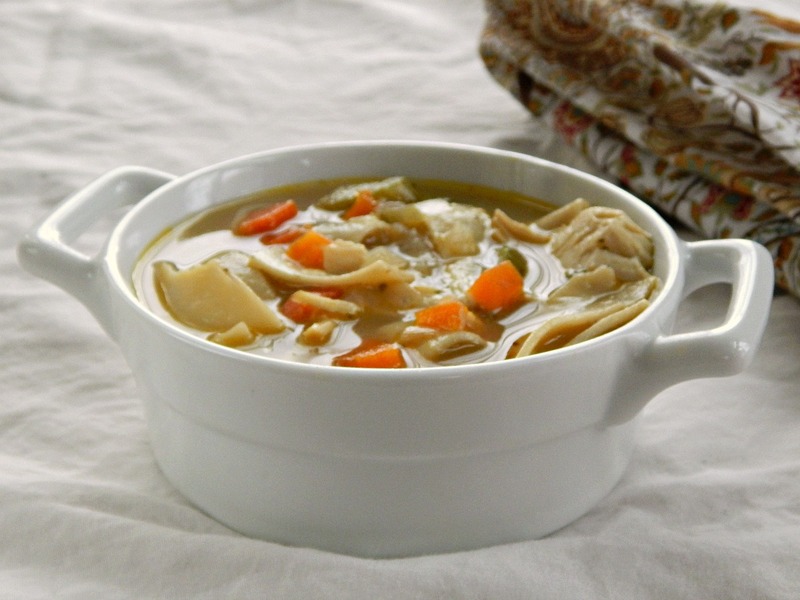 This was one of my first posts since it’s a family specialty; it’s really a soup that rivals Chicken & Dumplings in flavor – without any heaviness or “gloppiness.” It’s really a go to family favorite and absolute comfort food in my book. I make this every year with leftover turkey after Thanksgiving, but I also keep an eye on other items than might languish after the big feast. If you have celery or carrot sticks from a crudite platter, they can be chopped up and tossed in this soup as well. Over the years as I’ve made this soup, from time to time I’ve updated the photos. I thought it would be fun to show the progression – same soup, but different photos. Admittedly, I’ve really struggled with the photography aspects of this blog but hope I’m improving! Scroll down to the bottom for a gallery of photos. Place a soup pot over medium heat and coat with the bottom with oil. Add the onion, garlic, carrots, celery, and marjoram. Cook and stir for about 6 minutes, until the vegetables are softened but not browned. Pour in the stock and bring the liquid to a boil. Turn head down and simmer until vegetables are tender, about 10 minutes. Add the noodles and turkey and simmer until noodles are cooked through – timing varies with the noodles. Season with salt and pepper. Sprinkle with chopped parsley before serving. A good broth or stock will make your soup taste great, but if for some reason it tastes a bit flat, a few things can help. Maybe it needs salt or pepper, and a bit of acidity can brighten a soup – a small squeeze of lemon, a few drops of vinegar. If your broth is just too weak, you could add a bit of chicken soup base. Home-made Egg Noodles – easier than one would think! Per Serving (excluding unknown items): 377 Calories; 12g Fat (29.7% calories from fat); 32g Protein; 34g Carbohydrate; 2g Dietary Fiber; 74mg Cholesterol; 345mg Sodium. Exchanges: 2 Grain(Starch); 3 1/2 Lean Meat; 1 Vegetable; 1 Fat. If you came to this recipe looking for a way to use leftover turkey or chicken, be sure to check out the link below for 12 Days of Turkey for more ideas. You might want to see the sister post for 12 Days of Ham, too. This entry was posted in Click here for Bargain Meals, Click here for Fabulous Food Posts and tagged Bargain Meal of the Week, Chicken, Frugal Hausfrau, leftover Chicken, leftover turkey, Leftovers, planned leftovers, Soup, Turkey. Bookmark the permalink. yah they look good in the picture as well and this made me want to try it. i tried your recipe today! and turns out to be good. i’ll post about it right now and how i made it by adjusting to my different ingredients. do check it out ^_^ thank you. My pleasure! I’ll be stopping by.